전등사는 고구려 소수림왕 11년(381) 아도화상이 세웠다고 전하지만 고려 중기까지의 역사는 확실히 알 수 없다. 조선 선조 38년(1605)과 광해군 6년(1614)에 큰 불이 일어나 절이 모두 타버려, 그 이듬해 다시 짓기 시작하여 광해군 13년(1621)에 원래의 모습을 되찾았다고 한다. 대웅보전 서쪽에 있는 아담한 약사전은 중생의 병을 고쳐준다는 약사여래를 모시고 있는 법당이다.『대웅전약사전개와중수기(大雄殿藥師殿改瓦重修記)』에 조선 고종 13년(1876) 대웅보전과 함께 기와를 바꾸었다는 기록이 보일 뿐 언제 지었는지 확실하게 알 수는 없고 건축 수법이 대웅보전과 비슷하여 조선 중기 건물로 짐작하고 있다. 규모는 앞면 3칸·옆면 2칸이며 지붕은 옆면에서 볼 때 여덟 팔(八)자 모양과 비슷한 팔작지붕이다. 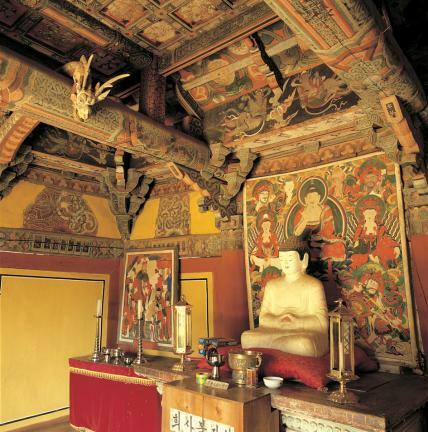 건물 안쪽 천장은 우물 정(井)자 모양이며 주위에는 화려한 연꽃무늬와 덩굴무늬를 그려 놓았다. 지붕 처마를 받치는 수법이 특이하여 당시의 건축수법을 연구하는데 귀중한 자료로 평가되고 있다. 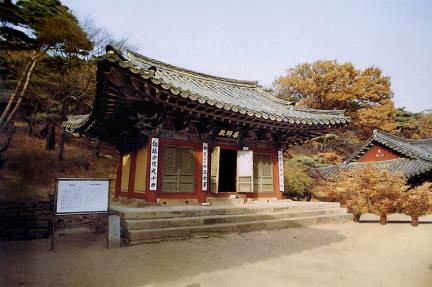 Yaksajeon Hall, which enshrines Bhaisajyaguru Buddha (the Buddha of healing and medicine), is situated to the west of Daeungjeon Hall, Jeondeungsa Temple. 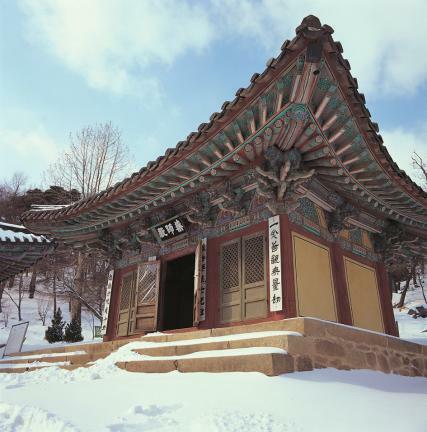 The temple is presumed to have been built by the Buddhist monk Ado in 381 (the 11th year of the reign of King Sosurim of the Goguryeo Dynasty), though very little is known about its history prior to the mid-Goryeo Dynasty. 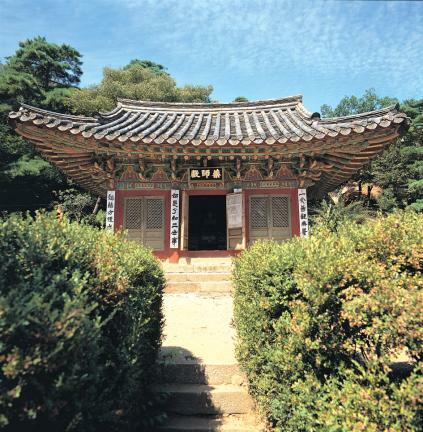 It is said that the temple was burnt to the ground by two large fires in 1605 (the 38th year of the reign of King Seonjo of the Joseon Dynasty) and in 1614 (the 6th year of the reign of King Gwanghaegun), and that it was fully restored to its original appearance between 1615 and 1621 (the 13th year of the reign of King Gwanghaegun). 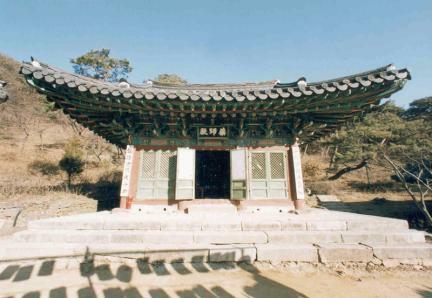 Although the exact year of the hall’s construction is not clear, according to the Records on the Renovation of Daeungjeon Hall and Yaksajeon Hall, the roof tiles for both Daeungjeon and Yaksajeon Halls were replaced in 1876 (the 13th year of the reign of King Gojong of the Joseon Dynasty. 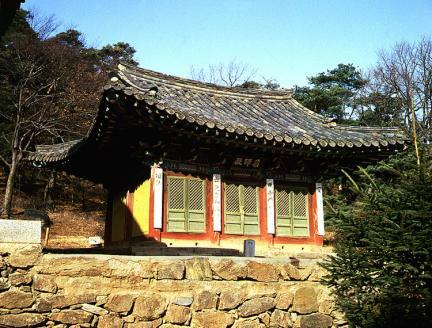 Judging from the construction style of Yaksajeon Hall, which is similar to that of Daeungjeon Hall, it is assumed that former was built during the mid-Joseon Dynasty. 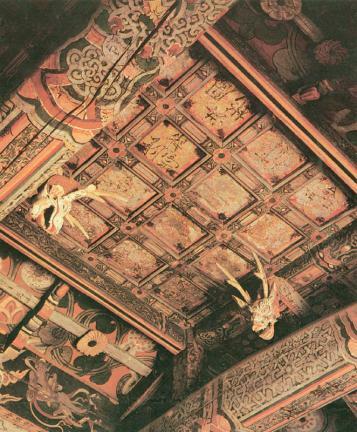 The hall measures 3 kan (a unit of measurement referring to the distance between two columns) at the front and 2 kan on the sides, and has a hip-and-gable roof resembling the character 八 when viewed from the side. 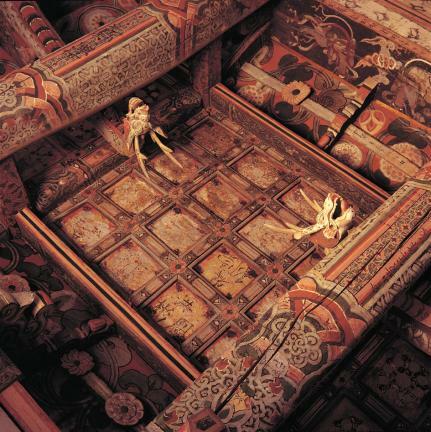 The building’s ceiling has the form of a sharp (#), and features magnificent painted designs of lotus flowers and vines in its background. 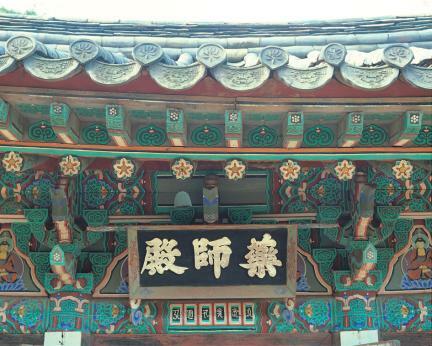 As Yaksajeon Hall was built with an unusual type of bracket system to support the eaves, it is regarded as an important cultural asset for research on the construction style of the time.